This is the Playoff semi-final. Alabama won the only prior meeting, 49-7 (-8) in the 2010 Capital One Bowl. The Crimson Tide were in a similar spot last year as they were nearly a double-digit favorite against Ohio State and lost, 42-35 (-8). Head coach Nick Saban is is 5-3 SU/ATS in bowls at Alabama and was 4-5 SU/ATS in bowls while the head coach at LSU and Michigan State (first meeting against Sparty). Michigan State is bowling for the ninth straight season. 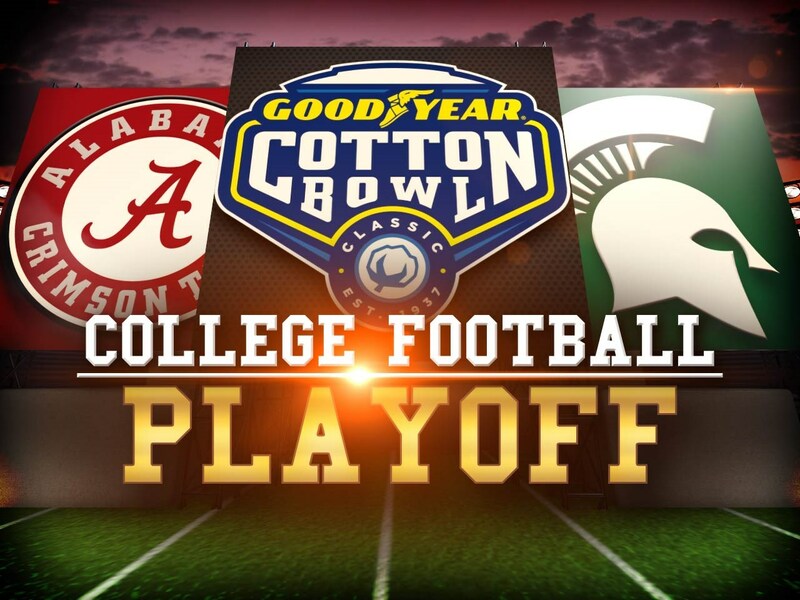 They beat Baylor, 42-41 (+2.5) in last year’s Cotton Bowl and head coach Mark Dantonio is 6-4 SU/ATS in bowls. Michigan State entered this year a legit National Title contender and haven’t disappointed. They got past Oregon, despite being outgained by 104 yards and got a miraculous win at Michigan on a blocked punt returned for a touchdown. They lost at Nebraska on a questionable non-penalized touchdown pass (receiver came back from being out of bounds) with under thirty seconds left. Quarterback Conner Cook was injured in the win over Maryland and missed the Ohio State game. Despite alternating two backups at quarterback, the Spartans beat the defending champs, holding them to just five first downs and 132 total yards (game-winning field goal with no time left). They beat Michigan and Ohio State without leading a single second in regulation. Michigan State beat Iowa in the Big Ten Championship game as they went 82 yards in 22 plays, scoring the game-winning touchdown with 27 seconds left. They are No. 13 in the FBS, allowing 88 yards per game less then their opponents average and their strength is along both lines of scrimmage. Alabama lost to Ole Miss via a deflected pass, but then steamrolled the rest of their foes in a rare down year for the SEC. Running back Derrick Henry broke Herchel Walkers conference record for most rushing yards in a season and won the Heisman Trophy. They are No. 1 in the FBS, allowing 155 yards per game less then their foes average and held eight of their opponents to either their fewest or second fewest yards. While Michigan State has one of the top offensive/defensive line combinations in the country, Alabama’s is even better. The Crimson Tide have better talent at every position with the exception of quarterback. Dantonio is 12-1 ATS as a ‘dog, winning nine outright! The Spartans also play their best in big games. Oregon, Michigan, Ohio State, and Iowa combined to average 219 (5.2) rushing yards per game, but Michigan State held them to 81 (2.5), so they matchup well against Henry.